Your stove is useful only when it works okay. So if you have any trouble, call our Newark stove repair experts. We come fast, repair any type of home stove, bring new parts to make the required replacements, and can prevent worst problems with gas leaks. Do you have an electric stove? We fix electric appliances too. At our Appliance Repair Newark business, we are updated, trained, and certified to fix any household stove whether it is a counter top or range. Our experts also install new stoves and help you whenever it’s best for you. Burner won’t heat up? Does the stove show some signs of premature wear? Let our techs in Newark check your appliance. When it comes to stove service, we respond as soon as we can. Our experts come equipped with spares, tools, and diagnostic equipment in order to make accurate assessments and effectively fix any problem. Stove issues can be caused by a burned out heating element, disconnected wires, gas problems, electrical issues, or incorrect installation. With stove repair expertise, our techs fix your appliance regardless of the cause of the problem. Speak to our techs whenever you want stove installation. It’s hard to install such appliances. They must be well connected and fitted for the avoidance of problems tomorrow. It’s best to leave such tasks to us especially if you get a gas stove. Improper gas stove fitting will make your kitchen unsafe and might compromise the integrity of the whole house. 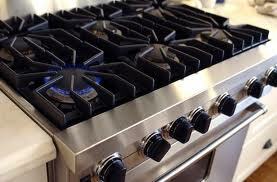 For the same reasons, call us if you urgently need gas stove repair in Newark, New Jersey. You will need our assistance if there is any problem with the appliance, signs of complications, something different with the way the stove works, or gas odors in your kitchen. Prevent chaos and enjoy your stove with our help. We are available to cover your stove top repair and installation requests any time. Just call our team.